Changers Blog Tour: Book Review + Unselfies! Published 12th January 2016 by Little, Brown. Goodreads Synopsis: Changers book one: DREW opens on the eve of Ethan Miller’s freshman year of high school in a brand-new town. He’s finally sporting a haircut he doesn’t hate, has grown two inches since middle school, and can’t wait to try out for the soccer team. At last, everything is looking up in life. Ethan is a Changer, a little-known, ancient race of humans who live out each of their four years of high school as a different person. After graduation, Changers choose which version of themselves they will be forever – and no, they cannot go back to who they were before the changes began. Ethan must now live as Drew Bohner – a petite blonde with an unfortunate last name – and navigate the treacherous waters of freshman year while also following the rules: Never tell anyone what you are. Never disobey the Changers Council. And never, ever fall in love with another Changer. Oh, and Drew also has to battle a creepy underground syndicate called ‘Abiders’ (as well as the sadistic school queen bee, Chloe). And she can’t even confide in her best friend Audrey, who can never know the real her, without risking both of their lives. My Review: As soon as I heard about Changers, I was so eager to read it – and it really didn’t disappoint. As it’s now out in the UK, I can’t wait to see what other people think of it! The premise of the book reminded me of Every Day by David Levithan, which was why the book piqued my interest. However, getting into it, I realised it’s definitely quite unique – Changers is a rather interesting blend of contemporary and fantasy, as the Changers are actually an underground, secret species of humans. I wasn’t too sure on the beginning – the scene where Ethan wakes up as Drew seemed a little cheesy in its dialogue and stuff, but the story definitely does improve. With many scenes conveying the general awkwardness of high school and growing up, it’s almost possible to forget the fantasy element in places! 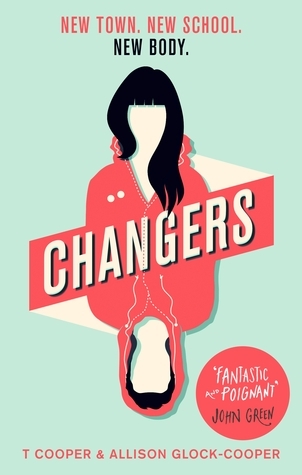 I really love how Changers openly discusses identities – I think the premise of this whole series is a brilliant, accessible approach to an important topic for teenagers. Drew is an incredibly relatable character – taking out the shape-shifting element, she’s such a realistic teenage character. She’s working out life, high school, crushes, and forming her own opinions about the world around her and the situation she’s been thrown into. I really liked how the authors made sure she was still very ‘Ethan,’ the person she was before her Change – Ethan’s identity is still there and the blend of two very different high school students is so interesting to read about. Overall, Changers is a really great (and relatively short) read that I would undoubtedly recommend to anyone who wants an engrossing story. It’s got a really important message at its core, woven into the plot, and I just really love the whole concept. I’m excited to read book two, and see what the protagonist’s next Change has in store for them! I received a copy of Changers from the publisher, in exchange for a review. In no way at all did this affect my thoughts. In Changers, there is a references to a site called wearechangers.org, which is set up by a separate group of Changers who are kinda rebellious. 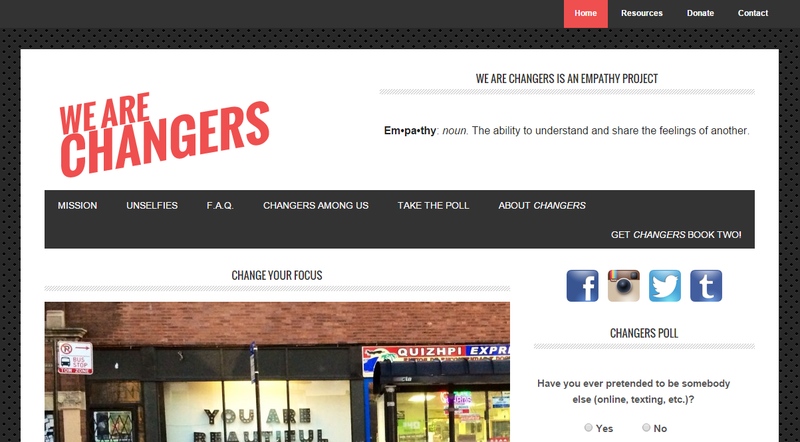 wearechangers.org is actually a website, run by the authors of the book, and coincides with the book’s message about identity and aims to spread positivity and empathy. I think it’s such a great idea! Checked out the website? Awesome, so you might have seen the #unselfies project on there. This is my favourite thing about the movement – the idea of turning the camera away and ‘focusing your attention outward.’. So, here’s my #unselfie! Enjoyed this post? Check out more about Changers on the rest of the blog tour stops, and be sure to share your own #unselfie online and on the wearechangers.org project! 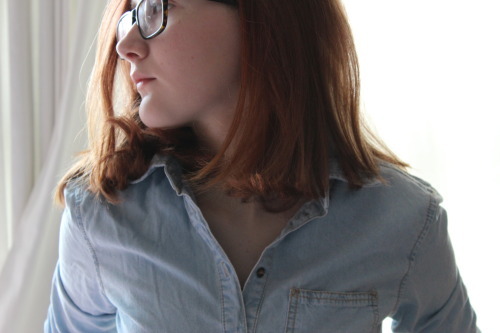 This entry was posted in Blog Tour, Book Review and tagged allison glock-cooper, Blog tour, book review, changers, contemporary, fiction, high school, identity, lgbt, t cooper, unselfies, usya, YA on January 16, 2016 by Gee. Awesome to know, I hope you enjoy it if you do read it 🙂 Thank you!